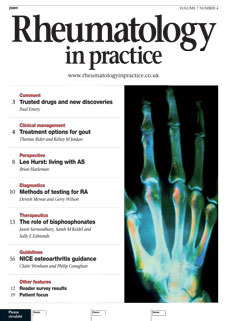 Rheumatology in practice is a review-based journal dedicated to rheumatology and its associated specialties. Written by leading experts, Rheumatology in practice provides a blend of review articles and practical guides to treatment, covering all aspects of rheumatology that are of interest and relevance to both primary and secondary care professionals. The current issue is available free of charge as a PDF. You can also browse back issues to the left, or search the archive to the right. Editor: Paul Emery MA MD FRCP Arthritis Research UK Professor of Rheumatology, University of Leeds, UK.